BAILED-out AIB is to hike its mortgage costs for customers on variable rates from September. Its move was followed within hours yesterday by Bank of Ireland and its subsidiary ICS, both of which are increasing mortgage rates for new borrowers. The AIB move to raise its variable rate for new and existing borrowers will mean additional payments of €60 a month for a homeowner with a €200,000 mortgage. Around 70,000 will be affected by the rise of 0.5pc. Owner-occupiers will see their standard variable mortgage increase from 3pc to 3.5pc. 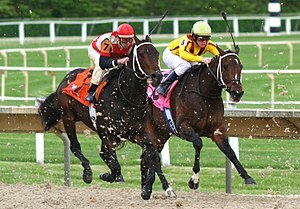 This comes despite the European Central Bank cutting its key lending rate to banks at the beginning of this month. Every 0.25pc rate increase pushes up the monthly cost of repaying each €100,000 borrowed by about €15. Has Queen Elizabeth II been NAMAed? Probably not, but a development on her property apparently is subject to a NAMA loan It seems that Ascot Racecourse in England had obtained a GBP 200m (€230m) loan from Allied Irish Banks (AIB) to develop a grandstand at the world-famous horse-racing venue. The grandstand is a major building development which incorporates shops and restaurants and its development in 2004-2006 is outlined here. Britain’s Independent todayreports that the loan was “among all the dreadful dross that has been dumped on to NAMA” but also claims that it is being paid off early – a winner for NAMA. What now for NAMA 2 and NAMA 3? To date, NAMA has acquired €71bn of loans for which it has paid €30bn. Up to last week, there were some €17bn of additional loans to acquire from the banks. That changed yesterday. The €17bn of loans remaining to be absorbed by NAMA comprised two elements: sub-€20m exposures at Bank of Ireland and AIB which were estimated to be worth a total of €12bn at nominal value and secondly €5bn of loans in respect of Paddy McKillen and other NAMA objectors. The €12bn of smaller loans at AIB and BoI are commonly referred to as “NAMA 2”, the €5bn of objectors’ loans would be regarded as part of the original “NAMA 1”. NAMA 3 was the codename for dealing with problem non-NAMA loans at the banks and certain categories of lending such as tracker-mortgages and non-NAMA commercial property lending were cited as examples of what might be included in NAMA 3. Sean O‘Rourke (RTE presenter): You say that you will end further asset transfers to NAMA, which are unlikely to improve market confidence in either the banks or the State , in other words nothing else is to be moved to NAMA. Is that the idea? Pat Rabitte (Labour party negotiator) Neither the transfers envisaged under NAMA 2 or NAMA 3 will happen. Because that’s not helpful in the overall crisis situation that we’re in. This would all seem to hammer the nails into the coffin of NAMA 2. 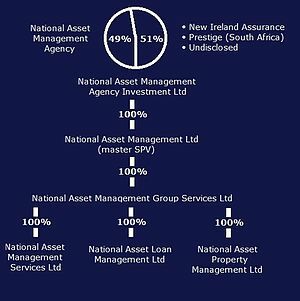 And a further implication is that the €5bn of outstanding loans in NAMA 1 will also remain with the banks as these loans, which include Paddy McKillen’s reported €2.1bn of loans as well as others, are understood to be “cherry assets”. Absorbing “cherry assets” and making an even bigger hole in the banks’ balance sheets is hardly going “to improve confidence in the banks”. So what now for NAMA 2 and NAMA 3? It seems that the smaller land and development loans that would have been in NAMA 2 are every bit as toxic as the larger loans already absorbed by NAMA which have attracted average haircuts for AIB and Bank of Ireland combined of over 50%. If NAMA 2 is not to happen how will AIB and BoI instil confidence that the value of these sub-€20m land and development loans are adequately provisioned? What I believe is likely, is that the banks themselves will set up internal transfers which will seek to value and ring-fence these supposedly toxic loans. And that too would appear to be the solution to NAMA 3, an internal good bank/bad bank split where the valuation and management of troubled assets takes place internally in the banks themselves. From this distance it is difficult to see how such an internal transfer and split into good bank/bad bank is very different to NAMA valuing the loans and then managing those loans. It may prevent the crystallisation of losses at the banks today but the markets will still suspect the toxicity of these retained loans. So we end up with a bit of a dog’s breakfast with an expensively-run NAMA plus we have good/bad bank splits plus suspicion about the values of loans retained by the banks. I wonder if the apparent change in policy towards NAMA 2 and NAMA 3 is akin to the FG commitment on quangos – merge certain quangos to reduce the headline number but overall they still employ the same people and cost roughly the same – and is just juggling the same loans but avoiding the optics of the unpopular NAMA expanding its remit? I also wonder what the EU/IMF will think of the policy as it is a term of the bailout agreement that the sub-€20m exposures be valued and moved off the banks’ balance sheets. Our lenders have already advanced €15bn and can’t be very happy at this and other recent developments such as the uncertainty of the commitment of the government to recapitalise the banks. NAMA’s valuation methodology for sub-€20m loans after the abandonment of loan-by-loan due diligence and valuation. The %s used are illustrative. So the “original threshold” for BoI and AIB was €5m and that was raised to €20m at the Big Bang announcement by Minister for Finance, Brian Lenihan on 30th September, 2010 and then reduced following the arrival of the IMF in November, 2010. But that is a detail, though I still believe that professional journalists should be more careful with the accuracy of their reporting and indeed editors should ensure that reporters are sufficiently briefed on a subject’s context before writing any old shyte on that subject. But there is a more serious criticism of established journalists and their reporting of the new NAMA Bill. There seems to be a focus on the Bill enabling NAMA to take over loan exposures of €0-20m at AIB and BoI. Emmet Oliver’s piece in the Independent today would be typical of that penned by the Premier League of finance reporters. But as stated on here numerous times, there never was a threshold for any NAMA loan enshrined in legislation. The NAMA Act defines in some detail eligible loans and there is a NAMA regulation that further expands on the topic. There were two ministerial directions in October 2010 aimed at accelerating the transfer of loans. But never has there been a mention of thresholds, be they €5m, €20m or anything else. NAMA simply decided for its own operational reasons to impose thresholds on AIB, Anglo and BoI (by the way, with respect to Anglo the claim was that there was practically no sub-€5m land and development exposure there – before Christmas there were suggestions that NAMA might revisit their assessment of Anglo’s sub-€5m loans). The principal reason for this NAMA Bill is to enable NAMA acquire these smaller exposures without valuing them on an individual basis, either before or after acquisition. This will plainly accelerate the acquisition of these loans. According to press reporting NAMA will use the experience gained in the past year of undertaking due diligence and valuing larger-value loans to produce haircuts that will populate the matrix shown at the top of this entry. So why doesn’t this new method of operation by NAMA make sense, let alone justify the claim on here that it is lunacy? NOW – NAMA is to acquire €13-17bn of sub-€20m loan exposures on a “portfolio basis” and apply a general haircut based on the agency’s valuation experience of large-value loans. Banks will be paid for the loans with consideration that comprises NAMA bonds (90.1%) and NAMA subordinated debt (9.9%). Although details of the new NAMA subordinated debt have not been released, the existing subordinated debt is issued on condition that it will not be honoured unless NAMA breaks-even over its lifetime. So banks replace uncertain loan values with approximated values and will apparently risk 9.9% of the consideration not being paid in 10 years time. So much for certainty, either for the valuations or for the consideration. (2) THEN – NAMA was to protect the financial interests of taxpayers (or citizens as Vincent Browne would correctly claim) by ensuring NAMA only paid what the loans were worth plus a small state-aid premium in the shape of the long term economic value premium. NAMA would claw back any overpayment and at the end of NAMA’s life a levy could be applied to banks if a loss was made. NOW – NAMA is acquiring loans on a portfolio basis without individual valuation. NAMA is applying haircuts to the smaller-value loans based on the experience of valuing the larger-value loans. There are those who have claimed that smaller-value loans would have fallen more in value than larger-value loans. I tend to agree with that view because (a) I am personally aware of many €1-3m transactions where a field was bought outside an urban area (especially provincial towns) for the purpose of building 5-15 properties and today I pass many of these fields which have practically returned to agricultural use with a value some 98% off the value at peak with development potential (b) there was a mad dash at the peak of the boom to lend money for property development and many “amateurs” decided to participate and I expect these “amateurs” will have made poorer purchasing decisions than the larger-scale “professionals” (c) I expect loan documentation for smaller value loans to be of a poorer standard than the higher value loans if banks were giving priority to higher-value transactions. So I believe there is a good case for arguing that haircuts to be applied to smaller-value loans should be higher than those that applied to higher-value loans. I might be wrong of course but it will now be NAMA that takes the downside risk (if NAMA undervalues, then it seems that NAMA must pay an additional sum to the banks at a subsequent stage). (3) THEN – NAMA was to share some risk with the banks by holding back 5% of the purchase price (the subordinated debt) which would only be honoured in 2020 if NAMA broke-even. (4) THEN – If NAMA made a net loss over its lifetime, a levy would be applied to the NAMA banks to recoup the loss. NOW – of the the NAMA banks – AIB, Anglo, BoI, INBS, EBS – only BoI has a prospect of continuing outside State control (and I would have said that with an imminent preference share dividend of €214m due on 20th February, 2011 and a challenging €1.5bn capital raising target by 28th February, 2011 that the chances are high of the State increasing its stake from 36.5% today to over 50%). So if NAMA makes a loss how will the State subsequently apply a levy to the banks. INBS and Anglo should be no more than a distant unpleasant memory in 2020. EBS is being sold today but what buyer will want to take on a substantial contingent liability? AIB is likely to be put up for sale but again what foreign bank will want to buy AIB if it has a large contingent millstone around its neck. And as for Bank of Ireland, well let’s see if it remains outside State-control in the coming weeks. All in all, this levy provision looks nonsensical though it is confirmed in the present Amendment. NOW – although bank employees may face 10-year stretches in jail for providing inaccurate information on sub-€20m exposures (the same standard term for murder in the State by the way), we must remember the recent claims by NAMA that the banks seriously misrepresented the value of their eligible loans to NAMA in 2009. Indeed these recent serious claims are presently being investigated by the Financial Regulator, Matthew Elderfield because there may have been misrepresentation to the stock exchange. NAMA claims that it can’t act on the inaccurate information provided by the banks because (conveniently) the information was provided before NAMA formally came into being at the end of December 2009. (6) THEN – NAMA was to manage the loans itself to ensure the cosy relationships that had built up between banks and developers did not compromise the future work-out of the loans in a way which financially disadvantaged the taxpayer. Of course it was always the case that NAMA was only going to directly manage the larger value loans itself (the top 170 worth some €50bn at par value) and the remainder was to be managed at the original institutions under the aegis of outsourcing specialist, Capita. NOW – It seems that these smaller-value loans are to be managed entirely by the original banks. So in a nutshell what this Amendment does is put a highly approximate value on €13-17bn of loans at the banks, allows the banks to continue to value the loans forces the banks to accept uncertain consideration, exposes the taxpayer to higher losses and puts a high store of trust in the banks providing accurate information (which they didn’t in 2009). Lunacy. Although the NAMA Bill was referred to by the Taoiseach and then Fianna Fail party chief, Brian Cowen, last Saturday at his resignation speech, as one of the two vital pieces of legislation needed before the dissolution of the present Dail (the other piece of legislation being the Finance Bill which now looks practically certain to pass by Monday next), the NAMA Bill is not likely to be dealt with this side of a general election. It seems that it will be March 2011 at the earliest before it gets enacted by which time, it is likely to be either Joan Burton or Michael Noonan at the helm at the Department of Finance (though it could theoretically be Pearse Doherty, Brian Lenihan or a Green party deputy). Because Michael Noonan became the FG finance spokesman last summer after the failed heave by former finance heavyweight, Richard Bruton against party leader, Enda Kenny, we don’t know a great deal about Michael Noonan’s stance on NAMA. Joan Burton’s stance is fairly well established and it would seem difficult to reconcile her support for NAMA transparency and value for money with the provisions as presently drafted. And I leave you with the depressing fact that regardless of the name on the Minister for Finance’s office door come March 2011, it will still be the same civil servants that effect the implementation of policy. The wolves are minding the flock!